I’d been planning this for about a month now and the day came for me to begin putting together a medieval feast. It was originally supposed to be a Valentine’s Day affair, but scheduling meant it had to be pushed off until Thursday (the 15th) in stead. I banished everyone from the kitchen – this was to be my gift to them. After weeks of running and seemingly scarcely being home, it was my way to tell them I love them. Let me tell you about our small feast and what I learned from it. This week I heard a message entitled “The Greatest Hour of the Church”. The faith-filled part of me affirmed the statement. My inner skeptic, however, wanted to simply reduce the title to a by-product of today’s tendency to describe EVERYTHING as… “the biggest”, “the best” and “the most incredible”… ever! In the end… my inner skeptic lost the bet. French Crêpes… not just dessert! It’s the monthly #TravelTuesday post and today we’re talking crêpes. Crêpes are not part of my native culture. The thin and very adaptable base so common in French culture was virtually unknown to me until I was in my teens. In its stead, growing up in eastern Canada, we had “pancakes” (or “flapjacks”) a much thicker & more filling version of the crêpe (or is the crêpe a thinner & more refined version of the pancake? )… Either way, where they were not part of my native culture, they’re a major part of my adopted culture! Grapes. Lots & lots of grapes. In the Old Testament book of Numbers (13:23-25) the Israelites sent to spy out the promised land discovered a place of plenty. In particular, they found a grapevine that was producing so well that they clipped a bunch of grapes to take back to the rest of their countrymen as proof. That bunch of grapes was so big that it took two men to carry it on a stick. It was proof that God had provided a good place for them to enter, a place of provision… truly a promised land! Pass the tissues please! Not so much because we’re emotional about the holidays (yet), but because we’ve all been fighting colds this week. As a Canadian living in France, the lead-up to Christmas has been a bit different as many of the visual cues that help you “get into the Spirit” have been missing. Eleven kids had a blast last Saturday as we hosted a games day with Franck & Marion Nowacki from Melun. Marion is the national Sunday School director and together with her husband, has ministered both in France and North America. It’s amazing how much fun 9 boys and 2 girls can have with 5 Nerf guns a big yard & some pallets for “cover”! They enjoyed a 1/2-dozen other games before ending the evening with a bonfire and marshmallow roast. The goal of the afternoon was to allow the kids to connect with the Nowackis through fun before they ministered to the kids the following morning, where everyone became child-like and enjoyed their team ministry. The Lord touched young and old alike… we are grateful! We don’t have an Elf on a Shelf but we are sharing Christmas with a collie named Jacques. Friends Justin & Caroline Ward are spending Christmas in Texas and needed a dog-sitter; our kids were only too happy to oblige. It’s noteworthy that Jacques is a well-travelled dog. Justin got him while he was an AIMer in Romania then returned to the USA with him before moving to France. Way to go Jacques! Christmas eve day was fun & kind of unique! The city built a temporary ice skating rink right in front of city hall and the kids had been dying to go. We got together some friends and headed down. When temperatures are 13 (55) degrees though… it’s pretty hard to keep ice… well… hard. There were puddles all over the place and within minutes, after a few falls, the boys were rather wet! … but they had an absolute blast! We walked through the Christmas market and had a hot treat to warm the insides before heading back to the house. Normally at home, my mom’s seafood chowder is on the Christmas eve menu, but given the distance, we settled for corn chowder in stead. We started it off, however, with France’s famous foie-gras on baguette with some apricot jam as an appetizer (Oh… my!) and ended the evening by watching “The Nativity Story“ a 2006 depiction of Jesus’ birth… great show! I love it that our kids are getting older. We weren’t awakened until 8:30ish! There may have been some Nerf-gun wars, some colouring & some new pyjamas. We were able to find turkey (unlike at Thanksgiving – it’s mostly a Christmas meat) and Liz had some lime jello to make cucumber salad; so dinner was a hit! After supper, since we’re dog-sitting a collie, what else was there to do but to watch Lassie before having a game of Apples to Apples & hitting the hay. Next week I’ll be posting a video for you and newsletter subscribers will receive a couple of bonuses as well… but more on that next Saturday (when we’ll be in 2016… can you believe it?). Thank you for walking this road with us! We are here because of your generosity and see God’s hand at work because of your prayers. Merry Christmas friends. God bless you today! Sunday afternoon we attended a local chocolate festival. The highlight of which for Timo was getting to work with a chocolatier and make his own chocolate creation… for only 5€. He chose his base (milk chocolate) as well as a number of decorative garnishes (teddy bear, race car, leaves & lady bugs) and cemented them to the base using chocolate. It went into the fridge to firm up a bit and we got to take it home when we’d finished making the rounds. The second photo shows great big rounds of home-made nougat. Oh. My! Liz, too, got a little spoiled because we managed to find a few cheeses and an olive merchant as well. Well, I promised it to you a little while back, and here it is: a “before & after” pic of the hedge at church. It had gotten out of control long ago and being along the front road, really needed to be done. Together with 2 other men, 2 chain saws, several afternoons worth of work and a couple of trips to the hardware store to sharpen the chains… we managed to tame it. The “before” pic shows a good 25′ (8,5m) of tree height with a span of roughly 11′ (3,5m). 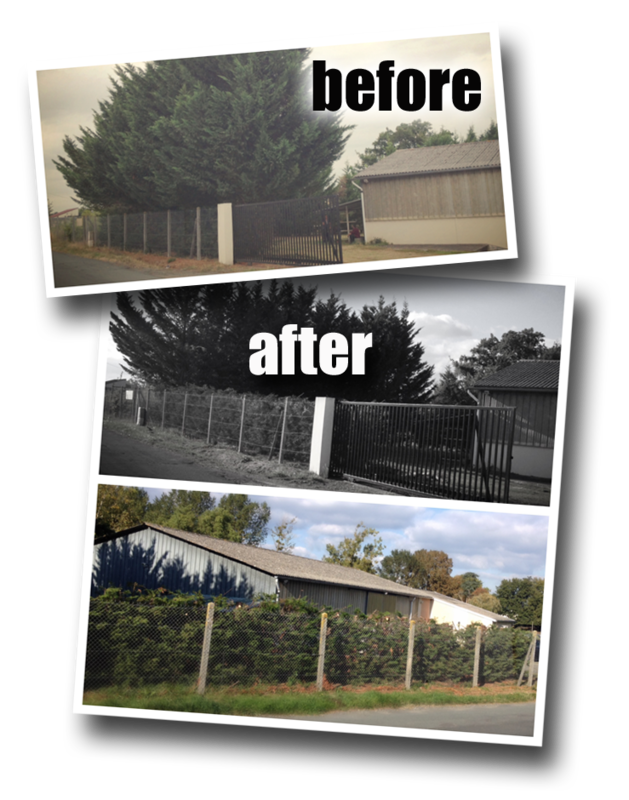 The “after” pic shows the hedge trimmed down to the same height as the chain-link fence. What a HUGE job! Thankful to the Lord for his protection while getting this done! This week we also had two very special visitors as Liz’s parents arrived from Belgium. Although we’d seen them twice since coming (albeit for very short visits each time) this would be the longest visit not to mention their first time in our neck of the woods. They got the guest room meaning that Sophie bunked out with the boys (you can see a picture of what the kids’ room looked like) and among other activities & time spent together… Timo learned how to make home-made pizza with his Nonna (grandmother in Italian). Very good to have them with us! Last night we had a good evening with our neighbours, who came over for tea and dessert. These are the neighbours that we’ve connected particularly well with. So with all the positives… why on earth entitle this post “Mortified”? Because of the way the week began. We’d been having plumbing issues last week which led to the garage being partially flooded, twice, and it wasn’t rain-water. The pipe which carried away all used water had become plugged meaning that nothing was going through… not water from the bath tub, the washing machine, the sinks or…. the washrooms. God bless the plumber who came to resolve the situation. He checked the drain (through an access point in the lawn). As he he began unscrewing the lid, all that had been backed up began to overflow the access point… at least 15 gallons worth. Someone needs to invent pipes that don’t clog… that’s all I’ll say. Once again, God bless that plumber! Finally… Canadian Thanksgiving was last weekend so we’re taking advantage of Nonno & Nonna’s visit to have a Thanksgiving dinner together later today. We couldn’t find a Turkey (they’re really only somewhat common here at Christmas) so we’re going to have chicken in stead. If you could pray for ONE thing this week, it would be for our youth. There are a couple of them that are asking million-dollar questions about God and tomorrow, Bro. Kabasele will be speaking to them on the oneness of God. Pray for wisdom and understanding among our youth! Thank you for visiting, God bless you today! Last week I promised to tell you about the canoe in the wind… and I’ll get to that, but first let me tell you about our “Care package on steroids” kind of week! One of Liz’s friends and former colleague at Air Canada was wanting to come for a visit. Because she travels light, she brought with her two extra suitcases: One filled with things that we’d left with her in Montreal back in January and the second filled with treats from folks back home, including the aforesaid KD, Craisins, Starbuck’s instant coffee (nearest starbucks is 265km away), chocolate bars, chocolate chips and chocolate chunks, baking powder, etc. We weren’t only glad to get the goodies that she brought, it was also nice to spend time with a familiar face from home. Milena was one of the first folks that Liz got to know when she began at Air Canada 18 years ago. We spent a day together visiting perhaps the smallest castle in the Loire Valley: Azay-le-Rideau. I’d visited it back in 1995 but hadn’t been back inside since. If it wasn’t the kind of place that requires some 200 million€ in renovations (price tag of renovations currently going on), I think I could live there. Travel Buddies: Thanks to missionary Colleen Carter (Ghana, Africa) the kids got travel buddies: fuzzy critters who love to travel, who live in an Altoids box and who remind missionary kids (MKs) that someone is praying for them on a regular basis. This is their second set of travel buddies… the first having come from the Sunday School department at Mission Point… our home church. Thank you for praying for our kids! A few years ago, Liz & I translated Bro. Timothy C. Mitchell’s (Montgomery, Alabama) discipleship study entitled The Way More Perfectly. It then went to Les Traducteurs du Roi for final editing & printing. We received 7 printed copies that we will be able to use with some of the new believers here in Châtellerault. Thank you, Bro. Mitchell for letting us be part of this project. Thank you to Scott & Liane Grant, Career Church Planters in Quebec, for sending us copies of the finished project! Ahh… at last. The kids have been getting to know two kids who’ve been spending lots of summer-vacation time with their grandparents, who live across the street from us. Last night they went for an evening swim at the same lake where Sébastien was baptized. They’ve also played some soccer, basketball and dominoes games together… (ever heard of “Chicken Foot“?) Lots of fun and finally… seeds of friendship! OK… I’ll tell you about it since I promised it last week. After his day-job was done, my dad’s was also as an Old Town Canoe distributor. He did a lot of paddling himself and guided trips as well. Though my brother has followed dad’s lead more than I, I do still know a bit about flat water paddling. If you find yourself in open water and the wind kicks up you can easily get in trouble given the canoe’s shape and the way they ride low in the water. The canoe will rock & roll with the crests & troughs if you remain parallel with the waves and, if they are rough enough, you can easily capsize. Still, it’s not impossible to safely navigate such water… the secret is to drive the canoe into the waves… crossing them perpendicularly. In this way they slice the waves, rather than being victim to them. We would do well to face trial & difficulty head-on as well: Tackling and mastering it rather than hesitating and falling victim to the agitation that it can bring. …for all the love that we’ve felt in recent weeks and for your prayers, we know it makes a difference. God bless your day today. Want to touch the life of an MK? I’m feeling something that I haven’t felt for a while… it’s both familiar and rather new at the same time. Let me give you the background. Last year at about this time, my family doctor did the run-through and indicated (in no uncertain terms), that she would like to see me lose 10lbs because it would be better for my overall general health & energy level and would set a good example for my family. I’m neither dangerously overweight nor even close to being obese, but there are several inches and pounds that could be shed and I seriously wouldn’t miss them. In younger years, I could eat whatever I wanted in just about whatever quantity I wanted and the scale wouldn’t budge from 145lbs… then the upper 30’s hit! In my most recent visit to the doctor, in preparation for our departure to France, she noted that while I’d gotten the 10lbs-thing right… I’d headed in the wrong direction… gaining since last year rather than losing (she was not impressed). So since then, I’ve been eating less. And I’ve experienced a feeling that I’d not felt in a long time. Hunger. Limit of 1 slice of bread per day (heaven help us in France… baguette-land) and have eaten a very light breakfast. Lunch has been 3 pieces of fruit. I’ll have my “meal-meal” at supper time (I know… not the best, but it’s what fits the work schedule). and yes… I’ll still have a snack or dessert at some point in the evening. Overall… the quantity of food has diminished and I’ve been better about not snacking on junk. which leads me to this strangely new (re-discovered) yet familiar feeling in the pit of my stomach… hunger. It’s kind of odd to feel that feeling, yet it’s surely there. The growels can attest to that. …and in an odd way, it kind of feels good. Hunger is something that is, by and large, absent in most of the homes & families that I’m connected to on a daily basis. Generally speaking, we. have. plenty! – Oh we may have cravings, but that’s not hunger. – We may be dying for a burger, but that’s not hunger. is it a need or a want. – I would love a bag of chips… but that won’t nourish! We satisfy our wants before our needs. In this manner, hunger is masked by shallow satisfaction, and true nourishment is sidelined in favour of the sweet & salty snacks. Wake up… Not hungry enough to eat, but not awake enough to leave without coffee (which stifles appetite). Grab a cup of java & head out the door. Mid-morning… a little hungry but not enough to really eat-eat and since it’s not lunchtime, we don’t want to ruin lunch. Mid-afternoon…. “Man that pastry / bag of chips / chocolate bar is looking good!” you have one or two… after all, no sense eating now. You’ll be off in two hours and it’ll be supper time. C’mon. Don’t act like that’s never happened to you! Have you ever felt the same way spiritually? Hunger for a meaningful walk with God. Hunger to accomplish something meaningful for Him. Hunger for meaningful relationships in the church. Hunger for a better prayer life. Hunger for a deeper understanding of and relationship with His word. Hunger to see someone close to us experience salvation and start a walk of their own. But we’re not always satisfied. Could it be for the same reasons as outlined above? We know what will truly satisfy our hunger, but in the meantime, there’s a snack over here and a treat over there. Something that will temporarily abate the hunger and take the edge off… “dulling” the pangs so that we don’t feel them as keenly… but it doesn’t really nourish, give our bodies what they need. There’s something actually kind of nice about feeling a hunger pang or two. It tells me that I’ve not over-eaten... and have you ever noticed that when you’re truly hungry… healthy food tastes better… you’re glad to have it? …for stopping by again today! … just enough hunger to keep the edge on. … just enough hunger to help you appreciate the good food. … just enough hunger to let you know that you’ve not eaten junk. Time and again I’ve sat near the seashore and watched the scene unfold, and this time was no different. A small flock of sand plovers glided low over the sand before us, landed within several feet of each other and proceeded to begin foraging through the sand in between waves flooding the sand beneath their fast moving feet. I watched one in particular which, as soon as a wave receded, would scurry out, begin foraging for food and work it’s way back in, hurried along by the next wave coming behind. It repeatedly stuck its beak into the saturated sand feeling around for something to snack on; quickly and diligently, only stopping briefly to watch for any sign of danger, gradually working it’s way up the beach. Then, it took to the air, flew back down the beach, landing close to where it started from and begin the whole process again. It did this several times, and I was amazed at this little bird’s pragmatic approach to its day… to survival. Being a nice day, there were no storms on the horizon nor any imminent danger… so all it needed to occupy itself with was finding food. It also reminded me of something else. (23) Thus saith the Lord, Let not the wise man glory in his wisdom, neither let the mighty man glory in his might, let not the rich man glory in his riches: (24) But let him that glorieth glory in this, that he understandeth and knoweth me, that I am the Lord which exercises lovingkindness, judgement and righteousness, in the earth: for in these things I delight, saith the Lord. that this God we know and understand exercises lovingkindness, judgement and righteousness (not only THAT… he gives us a clue…) he delights in these things. Do we want God to take pleasure in us? If so, I must seek to cultivate, in my life, things that He delights in. Lovingkindness – is exercised toward those around me. If I will cultivate this, then relationally my life will be richer and more simple. Judgement – is first and foremost exercised toward myself. If I will cultivate this, then my life will better reflect the gospel that I profess. Righteousness – is exercised toward God, but should also be visible to others. If I will cultivate this, then spiritually, my relationship with God will be rich and meaningful. Principles are what drive rules and or behaviour, not vice-versa. Principle are overarching and rules specific to particular scenarios. The Old Testament shows us quite clearly that long lists of rules make life more complicated and are, in fact, impossible to keep flawlessly. Jeremiah relayed to God’s people 3 simple principles in this passage. If I will concentrate on them… life really will become simpler as I won’t have the time or energy to get caught up in any number of other distractions. (4) I must work the works of him that sent me, while it is day: the night cometh, when no man can work. He went up and down the shoreline undistracted from his task of finding food, what he needed for survival. What do we need to do to survive? We need to not get caught up in the daily distractions; things unnecessary. We need to cultivate things in our life that will cause the Lord to take pleasure in us. Lord, let that characterize our preparations for and our time in France.